Home/Archive by Category "The View"
Good People Doing Bad Things – How Did We End Up Here? It is a story that has made news headlines the world over. A story about culture and greed impairing the judgement of people who should have known better. While both sides of politics have been very vocal in the wake of Hayne’s interim report, no one has touched the vexed question of how did we end up here? The impact on the victims has been devastating. The behaviour of the financial services community despicable and unforgivable. The viewing has been a mesmerising blend of ‘can’t watch but can’t look away’. But to understand how we got here we need to look back nearly 30 years to the remarkable and visionary reforms of the Hawke/Keating government. That is, not at any level to lay blame at their feet but to point to a moment in time where the first piece of a complex puzzle was laid. A puzzle that through the next 25 years would gather a trifecta of seemingly unrelated circumstances to form what has become the tsunami that is now known as the Hayne Royal Commission into Misconduct in Banking and Financial Services. Through the late 1980s and early 1990s, including the “recession we had to have” Hawke and Keating, followed later by Howard and Costello introduced reforms that led to Australian Banks becoming the most robust in the world. Reforms that would combine with the rise of China to open up the economy to what has now become 28 years of consecutive economic growth. Throughout this period the market capitalisation of these banks has increased ten-fold which given that they occupy 4 of the top 10 holdings in almost every Australian superannuation fund has meant that every working Australian has benefited profoundly from their unmitigated success. Forward to 2008 and the GFC. The worlds banks imploded under the weight of the subprime crisis and the freezing up of the credit markets. Bear Stearns and Lehman Bros were the high-profile casualties but there were hundreds of others. Australia was not immune. St George lurched into Westpac, Bankwest was rescued by CBA and Suncorp was saved by the timing of the government guarantee. But our big 4 banks prevailed, in-fact before long they were stronger. We were applauded the world over for the way that our economy survived the worst economic crisis since the 1930s depression with barely a flesh wound. There are those that claim dumb luck, but the strength and management of our big banks were in no small way responsible for Australia dodging a bullet. To this end, over 25 years Australia’s big 4 banks had developed ‘hero’ status. “Best in the world”, ”pillars of strength and resilience”. Their leaders were held on pedestals and retirees dined out on their ever-increasing flows of franked dividends. Another of Keating’s great reforms was the introduction of the compulsory superannuation system to deal with Australia’s soon to retire, Baby Boomer generation. In the banks effort to broaden their revenue base and continue with the exponential expansion of their balance sheets, the lure of a multi-trillion dollar pool of retirement saving made a lot of sense. Through the early 2000s each of the major banks made acquisitions to gain a foothold in the market. CBA bought Colonial, NAB purchased MLC, ANZ purchased Mercantile Mutual in a JV with ING and Westpac purchased BT and Rothschild. In these deals were the beginnings of the mutation that would see these banks lose their way. The acquisitions were ostensibly, old life companies. Sales based organisations where ‘agents’ were paid a commission for selling a product to a consumer. There was often advice involved but often not. The principle approach was ‘caveat emptor’ and the assumption that if the consumer saved something rather than nothing, then some good had been done. If advice was provided it was paid for by commission from the product manufacturer and effectively the public was trained to place no value on it. Advice became something that came with the product. But the need for considered, tailored advice was growing. The industry needed to become a profession and move to a fee based model where the public valued the advice and was prepared to pay for it. This was met with an innate resistance, ingrained over many years. The banks did not rail against this but rather acquiesced to their more learned wealth management sales executives who told them “it ain’t broke! Advice is paid for by the product manufacturer because consumers don’t value it”. The tyranny of the vertically integrated business model prevailed. The money flowed in. Billions of it. Further acquisitions were made to gain both product advantage and the favour of an increasingly spoilt force of advisors who had come to realise just how valuable their favour was. Consciously and in some cases subconsciously, advisors were adopting business models that made them more valuable to their product manufacturing friends by leveraging the risk of a change in loyalty in return for a large cheque ensuring tenure. Product manufacturers referred to the advisors in their sphere of influence as ‘distributors’ and acquisitions of distribution networks were made, making many owners of these networks unimaginably wealthy. The very word ‘distribution’ (not advice) said it all. This then brings us to the issue of the regulators. Let us not fool ourselves about the intent of the legislation that has been brought into play over several regimes. Quite rightly, it has been installed to change the behaviours of the industry and to ensure outcomes are focussed on ‘people before profit’. However, through a lack of understanding of the history of the business models and the products that were already in place, the impact these new laws have had is a disappointment. As each new wave of law failed to gain traction, the complexity of the laws increased and became so prescriptive that tick a box compliance was the only way to comply. Thoughtless, tick a box compliance. This was exacerbated by the constant cries of foul play by the Industry Fund movement who refused to accept that the retail offerings may in fact have offered a reasonable alternative to the moral high ground claimed by the Union backed Industry Fund regime. For every change the industry adapted, ‘the spirit’ of that change was compromised on both sides of the Retail/Industry fund divide. Thinking was dedicated to how to comply with the law without giving up the behaviour that the law was designed to change. As a result, consumer outcomes only ever improved marginally. In defence of the self-licensed advice movement, there has always been a constant pressure on the product manufacturing community to improve features and reduce the price of the end superannuation products to the consumer. But this cause was lost in the politics of the broader campaign because advisors need product solutions to execute their advice and the institutions controlled the product and the margin. When the major institutions were caught out they arrived with armies of lawyers from the top end of town to defend their position and ultimately negotiate on outcomes that were private, less costly and less damaging for the provider. The regulators could not afford to throw the same legal talent at the issue as they did not have the same budget or the internal talent to brief the legal team. It was a case of ‘bows and arrows against the lightening’. The regulator could not afford to lose for fear of loss of reputation or costs being awarded against them and so the ‘enforceable undertaking’ regime began. This, in a world where the Banks were still harbouring hero status and had an air of invincibility about them. Who were the regulators to question their integrity? Inside these institutions there was the ongoing pressure to improve dividends to the plethora of shareholders including the superannuation funds that most Australians were members of. There was a sense of untouchability that came with the fact that folklore had seen these institutions save our Nation from the full force of the GFC and that the senior management of these organisation was seen as the epitome of success in the corporate world. Geniuses who were to be revered at all costs and were never questioned or challenged. Is it any wonder that a mutation in the moral code was let loose at some stage in this journey and went undetected and unmanaged until the blow torch of the Hayne Royal Commission? It was a culture where the unjustifiable became more justified each time the behaviours, the decisions, the mutation went unchallenged. This Royal Commission has highlighted some heinous behaviours and the recommendations need to seek to ensure that we never find ourselves in this situation again, however it is worth reflecting on the 28 years of history that came together to all but justify the collapse in values that led to the outcomes that have been exposed. A combination of hero status, invulnerability, shareholder pressure, cultural misalignment and in the end dumb luck led the management of our most revered organisations to turn a blind eye to the social responsibility that is at the core of their existence. Much like the leadership of Australian cricket after a similar period of invulnerability. Let us hope that in the fall out we are not burdened with another wave of crippling regulation but laws that need to be thought about. Laws that challenge participants to ask ‘what is the spirit of this law and how do I need to interpret it?’. Tick-a-box compliance leads people to think about what they can get away with. We need new laws that acknowledge the role that these organisations can play in shaping a positive society and a positive economy and a code of conduct installed that all participants embrace as a way forward in the enhancement of a better financial community. “The law already requires entities to do all things necessary to ensure that the services they are licensed to provide be provided efficiently, honestly and fairly. Much more often than not, the conduct now condemned was contrary to law… Passing some new law to say, again, ‘do not do that’ would add an extra layer of legal complexity to an already complex regulatory regime. What would that gain? Reverberations will continue to be felt across the mahogany boardrooms and expansive top-floor executives suites of Australia’s admonished banking and financial services giants, as the royal commission claims more scalps while others jump the proverbial ship. The revelations exposed by the royal commission have been nothing short of appalling. As members of the profession – and as people who are proud to call themselves financial advisers – We find it jarring and disappointing that these are the circumstances in which the industry finds itself. Finding the ‘right time’ to comment has proven difficult. A pervasive “make-money-at-all-costs’’ mentality and systemic culture of cover-up within certain institutions has cast a dark shadow over the industry – and left a nation of now-sceptical investors wondering just who they can trust. They say sunlight is the best disinfectant. But in our rush to clean up the industry, it’s important we don’t simply create a set of different problems. Collaboration and consultation is needed to ensure we don’t trade one conflict of interest for another. By year’s end, with the sector purged of its sins amid the white-hot glare of political and media scrutiny, attention will soon turn to commissioner Kenneth Hayne’s recommendations and what legislation the Government will introduce in response. The recommendations will almost certainly centre around the banning of vertical integration and the removal of grandfathering of old remuneration models. Trailing commissions are now illegal for new products but are protected in old products still held. Changes we support as long as they don’t compromise a person’s access to advice in the process. The corporate watchdog, Australian Securities and Investment Commission (itself under scrutiny for being slow to investigate persistent concerns of misconduct in the industry), and Treasury have been highly critical of vertically integrated financial players, raising the pressure to break up Australia’s largest banks by splitting their financial advice and wealth management arms. Both ANZ and National Australia Bank are in the process of cutting their respective financial advice businesses and have already offloaded their life insurance operations. Commonwealth Bank is also in the process of considering offloading its Colonial funds management business and has sold its life insurance business. However, Westpac chief executive Brian Hartzer has said while stories of poor advice were “confronting’’ his bank was committed to keeping its BT Financial Group division. It’s believed there will be recommendations centred around asset-based fees and the separation of advice into a profession in its own right, the latter we would argue is the only way forward and only achievable with the removal of vertical integration. Take the family doctor, for example. When we visit the doctor, we expect they’ll recommend a treatment plan that is best for our wellbeing, ensuring we make the best recovery. We don’t expect the doctor will only recommend certain manufacturers’ drugs, or medical organisations’ facilities. We expect our health won’t be compromised by doctors being driven by their own remuneration. Financial advice as a profession should be no different. The core measure should simply be whatever improves a client’s financial welfare. Until real advice is distinguished from product-selling by legislation or self-regulation, how can anyone confidently accept undistinguished advice? While it’s eminently clear some legislative change is necessary – for example the recent recommendations by the Productivity Commission with regard to super funds and their ‘not so’ innocuous fees – the government must tread lightly when it comes to the size and scale of new reform it imposes on an industry that is arguably heavy in this area already. The on again off again… and on again Future of Financial Advice (FOFA) of 2013/15 addressed many of the issues in question. For those in the industry who embraced the changes and adhere to the compliance rules it dictates, we have already incurred significant and ongoing operational costs as a result. The oxymoron here is that constant and increasing industry regulation adds to the price of advice but undermines its value at the same time. In our view the real problem is business cultures blind to conflicts of interest on the basis that ‘everyone else is doing it’ – this is as much an enforcement issue as anything. Any knee-jerk reaction without due consultation with the industry and consideration for the (often complex and significant) flow-on effects to customers will only serve to further increase the net cost of advice and, we fear, drive clients and good advisers away at a time when they are needed most. And that would be the worst possible result. Volatility strikes back. Is this the start of a bear market? After an exceptionally strong year in markets, volatility has struck back in recent days. At the time of this writing, the S&P 500® Index has fallen roughly 10% from its record close on Jan 26.1 The Australian equity market has seen falls of smaller magnitude, given it did not participate to the upside through most of 2017 and January of this year. Nevertheless, the age-old adage of the US sneezing remains, and sustained volatility in the US is likely to weigh on our domestic market. Many of our clients are asking us if this is the start of a bear market. Our answer—probably not. Bear markets are almost always caused by a decline in the real economy. That’s because it takes a recession to simultaneously damage both the valuations multiples AND earnings growth of businesses. And right now, this does NOT look like a recession scare to us. Instead, two distinct forces are conspiring against global equities. First, the high frequency U.S. data suggests inflation is starting to re-accelerate—wage inflation in the January employment report surprised to the upside and touched its highest level since 2009.2This pushed the 10-year U.S. Treasury yield up to its highest level in four years.3 Higher discount rates are proving to be a challenge to the elevated valuation levels of U.S. stocks. In comparison, the Australian 10 year has pushed up to 2.9%, similar to the start of 2017. Australian equity valuations are not as stretched as that in the US, so any re-rating of valuations will not be as severe. Second, investor sentiment has taken a hit—market psychology was bordering on euphoria in late Januaryand is coming back down to earth now. For example, the share of respondents expecting stock prices to increase in the Conference Board’s Consumer Confidence Survey4 hit an all-time high in January. Our research teams have also pointed to evidence that a lot of the selling activity has been driven by technical reversals in trend-following strategies. A step back toward rationality should be a healthy development for the market outlook. The Australian market has been a bit of an anomaly through this period, missing out on the ride to euphoria in January. To put it in context, the S&P/ASX 200 actually fell by 0.5% in January, while the S&P 500 climbed 5.6%. Economic and earnings fundamentals, by contrast, are actually quite robust at the moment. The J.P.Morgan Global Manufacturing PMI™ hovered close to an 82-month high in January.5 And the fourth quarter corporate earnings season in the U.S. is tracking ahead of schedule—over 80% of S&P 500® Index companies are beating consensus revenue estimates (i.e., one of the highest beat rates in many years), and earnings growth is tracking north of 13%.6 Earning season for Australia kicks off in the next fortnight, and we note that expectations for Q4 earnings growth are much more muted than they are in other regions. Bottom line: We will continue to monitor economic and market conditions carefully in the coming days. But for the time being, this looks like a healthy correction in markets, rather than the onset of a bear market. Depending on the depth of the dip that we see in asset prices, this selloff could create an attractive entry point for investors to take more risk. Recent events highlight the importance of a diversified, multi-asset investment strategy. Even with the latest selloff, valuations on U.S. equities are still expensive. And elevated valuations create a negative asymmetry to the market outlook—the upside potential is limited, but the drawdown potential can be significant. It can be difficult to stay invested during periods of market stress. Buying low and selling high is hard. But it is precisely this emotional aspect to markets that creates opportunity for a disciplined investment process to add value in the long-run. In a matter of days, Santa will be putting the finishing touches on his “Naughty” and “Nice” lists and it remains unclear on which side of the ledger the banks will sit. It’s an understatement, of course, to suggest the big four (CBA, Westpac, ANZ and NAB) won’t be expecting an outpouring of festive cheer and goodwill from their 17+ million customers this year. Despite holding around 2.5 trillion of our money, collectively – (and 80% of the nation’s loans) – it’s become almost a national sport to criticise the banks. And, it’s got to be said, with some good reason. Concerns involving the banking sector date back at least three years, when a Senate committee recommended a royal commission into the Commonwealth Bank’s financial planning scandal. Last year, more wrongdoing was uncovered at CBA’s insurance arm (CommInsure) as well as allegations made against the other majors – ANZ, NAB and Westpac. But – without trivialising the impact of those scandals on the industry and, more importantly, the individuals and families affected – an expensive and lengthy royal commission is NOT the answer. The sector is already one of the most highly regulated in the world. Since the financial crisis banks have cooperated with 37 separate reviews, investigations and inquiries, leading to a raft of reforms from FoFA to Professional Standards to name a few. The current commission – which will run for 12 months, delivering a final report in February 2019, at an estimated cost of $75 million – is unlikely to unearth anything new. This is nothing more than a quick political fix, hastily thrown together by an under-pressure Government at the eleventh hour, to appease disgruntled Nationals senator Barry O’Sullivan and other backbenchers who were prepared to cross the floor and side with Labor and the Greens to pass legislation for an inquiry. It was inevitable. They knew it. The PM knew it. Despite spending a year and a half categorically, unequivocally ruling out a royal commission – an inquiry former PM John Howard warned would be “rank socialism’’ – the only option left was to make the best out of a bad situation and set its terms of reference and try to control the mandate. Malcolm Turnbull, already deeply bruised from the Dual Citizenship fiasco (at the time of writing the Opposition is now in damage control itself over the issue with several of its members potentially being referred to the High Court) appeared weak and out of touch with both his party and the electorate. Perception is everything in politics and the Prime Minister still appears to be in the pockets of the banks, because the backflip came precisely the day after the banks themselves signed the “permission slip” gifting the PM political cover. Politics has trumped economics yet again. On the positive side, the commission has promised a deep dive into more than just the banks and it looks like industry funds could be subjected to some unwelcome scrutiny. In its infamously titled “Rivers of Gold” report released last month, the Institute of Public Affairs found monetary links between a number of industry super funds and the Labor movement, with more than $18 million flowing to trade union organisations over a three-year period. Needless to say it has people talking. The problem is, there’s always a bigger picture. The risks of staging this inquiry in the full glare of the public spotlight is that you diminish the standing and strength of the banks, and undermine our economy with it. Granted, the big four are corporate powerhouses, earning billions in profits, but let’s not forget the old State Banks of Victoria and South Australia which collapsed, robbing thousands of customers of their life savings. A strong financial and banking sector provides a significant and crucial buffer to protect us all if the economy experiences a downturn, or worse. It was one of the key reasons Australia was able to withstand the GFC crisis, which forced the closure of 465 banks in the United States alone. Secondly, some will argue the Tall Poppy Syndrome is alive and well in Australia. We do seem to have a propensity to go after anything that is successful. Look what the mining tax did to the resources industry – our mining companies stopped investing in Australian projects and retreated overseas. The carbon tax hamstrung the automotive industry, with utilities costs an enormous burden. Thirdly, banks are the highest taxpayers in Australia – injecting around 14 billion into the government’s coffers each year. Finally, we simply can’t afford for world markets to lose faith in the big four. The flow-on effects would be disastrous, fuelling potential interest rate rises, asset contraction and a slowing economy. Even David Murray who led the last extensive review into the financial sector agrees. He has hit out at politicians and regulators fearing that “if the commission forces banks to grant widespread forgiveness of soured loans, it could undermine the entire system”. The Australian Financial Review, 6 December – Bank probe ‘threat to the system’. This may not be a royal commission we had to have, but we’ve got it. And only time will tell what lasting impact it will have, both financially and politically. As we hang our stockings and trim the tree this time next year, Chief Commissioner Kenneth Hayne will be close to wrapping up the inquiry, putting the finishing touches on the final report for public consumption. The proof, as always, will be in the pudding. A mate recently cancelled his gym membership at a popular city health club, citing lack of motivation, high monthly fees and a general malaise about “just not getting results’’. Out of interest, I asked him what his training regime looked like. A brisk walk on the treadmill, he confessed, followed by a quick sauna and an obligatory large iced-coffee (with cream and ice-cream) in the club lounge afterwards. Those stubborn kilos are still hanging on for dear life. Comparisons can be drawn between my friend’s story and the heated – often hysterical – active versus passive investment debate dominating financial news headlines in recent months. Proponents of active investment, quite rightly, argue for its superior ability to outperform the market over the long-term, with astute investor-led analysis and individual market research informing which stocks to include in any given portfolio. But active management is far more than just stock picking and here lies the often unseen value. Active management utilises all the tools available to achieve a tailored outcome for investors; asset allocation that considers the return you need at the risk you can live with, dynamic management to help avoid downside risk and ‘smooth’ the ride, precise factor exposures and even tax strategy – there is no one right way to invest for everyone. Each investor has a unique set of goals, real-world constraints and risk preferences. This is contrary to passive investing, which follows the index, relies on trends and is often based on exchange-traded funds. The Australian market is dominated by two sectors – banks and resources. And the top 20 Australian-listed companies account for 47% ($804 billion) of ASX200, leaving the remaining 180 stocks to make-up the remaining $900 billion. The inherent risk with a passive Australian shares strategy tracking the S&P/ASX 200 Index is that it will overweight companies that have gone up in price and, therefore, have greater representation in the Index. So, when they fall, the portfolio hangs on for the ride from the peak to the trough – with painful consequences for total returns. The bottom line is – markets are cyclical, what is winning today could lose tomorrow. A philosophy that rewards past performance at the expense of future prediction isn’t an intelligent, strategic approach to creating wealth. Also, it’s important to understand the distinction between cost and value. There is no disputing that passive strategies typically have lower fees and have done a good job of beating ‘average active managers’ (their term not ours). The key word here is average – an average manager will probably deliver average results. Our advice is to only use an excellent active manager – one who has the runs on the board, with a disciplined and robust process that is bigger than any key individual and will endure beyond the current group of people. Find an active manager who reports their fees. Transparency is king when it comes to trust and building strong long-term relationships. Warren Buffett once put it simply. I just advise looking at as many things as possible and you will find some bargains. And when you find them you have to act, Buffet said. The prevailing truth is that price doesn’t dictate a great company. Good investors must do proper due diligence in determining whether, firstly, they’ve found a great company and, secondly, if it’s a great company at a great price i.e. it can be a great company but the price might already reflect that in which case it is not a bargain. There are no shortcuts. This takes thousands of hours of quantitative research, face-to-face meetings, stress testing analogies and scrutinising their balance sheets, and ongoing monitoring. That’s the beauty of astute, wise and experienced (‘above average’) managers, they invest their time, energy, experience and the muscle to do the heavy lifting for their clients and the results speak for themselves. Here at FinSec building sustained long-term wealth for people is at the core of ‘why we do what we do’. And, although no investment manager can ever promise they will always beat the market (if they do, run in the opposite direction) long-term wealth is only achieved with a smart, strategic and transparent investment policy and an in-house investment committee accountable to it. It’s an approach any ‘above average’ manager should be able to prove and is best illustrated by an example of our own performance plotted below. 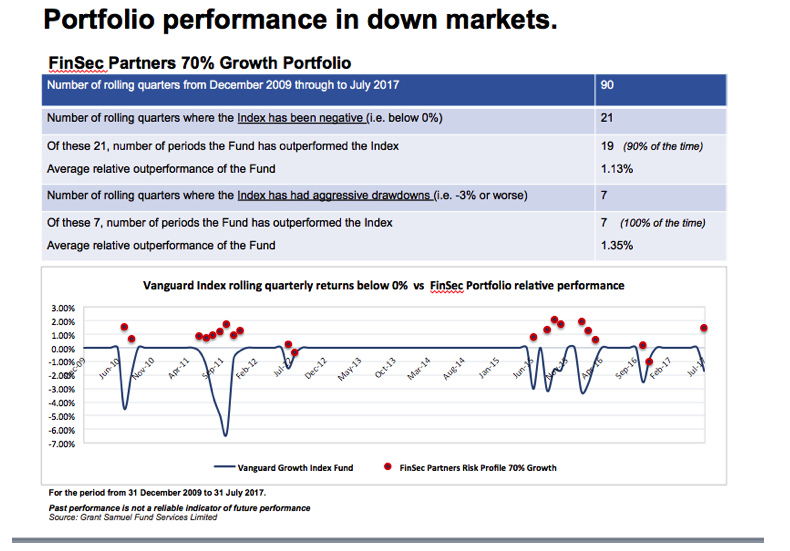 (Blue line is the index compared with FinSec’s performance represented by the red balls). Which brings me back to my mate. Him not shedding his winter weight, of course, wasn’t the gym’s fault. He just didn’t have the right training schedule and he could have done with the disciplined, rigorous support of a qualified and experienced personal trainer who knew how to get the best out of him to enable him to achieve his goals. US Election 2016: Trump Wins. How Markets will React? How Markets will React: A Short, Medium and Long Term View. While there was a quick selloff at first signs of a conclusion to the U.S. elections, and markets seem to have recovered quickly, there still may be some near-term volatility. As with many geopolitical events that generate market swings, the first priority is to rationally evaluate your chosen investment strategy. Review your primary market indicators (we use cycle, value and sentiment), consult your expert advisors and then chart your course over the long term rather than as a reaction to current events. There could be opportunities you miss if you rush to follow the herd. Looking at the potential longer-term global ramifications, President Trump may call into question the decades-long assumption that more trade is good trade. The “Brexit” vote this past summer was one shoe dropping on a growing belief that trade may not always be good. The U.S. presidential election is another shoe. Trump has opposed the Trans-Pacific Partnership, said he will re-negotiate or tear up the North American Free Trade Agreement (NAFTA) and has generally shown a willingness to renegotiate trade deals with anyone. Most investors in a global economy will be watching how U.S. trade policies develop. Even though such a drastic change in administrations may seem jarring to some, the American political system has plenty of checks and balances, which is why no president since Franklin D. Roosevelt has been able to enact a truly far-reaching agenda like the New Deal. Plus, the U.S. economy is driven far more by the private sector and consumer spending, in particular, which accounts for nearly 70 percent of economic activity. Fundamentals matter more for the outlook: what happens with earnings growth, economic growth, and monetary policy are likely to be much more influential than presidents when it comes to financial markets, in our view. And don’t forget that the U.S. Federal Reserve (the Fed), which holds many of the economic levers in the United States, has an important meeting in December. We still think the Fed is on track to hike at that meeting, but it is a much closer call after today’s outcome. Janet Yellen and the Federal Open Market Committee will be looking at financial conditions to see whether markets stabilize before making that important policy decision. So we don’t see this election as having a lasting impact on markets. True, it will take some time for investors to consider the implications of a Trump presidency, and act accordingly. But there are sectors that might benefit—energy could outperform, given Trump’s insistence that he will reduce regulations and work to boost output of oil, gas and coal. Healthcare and biotech stocks, which faced concerns that Hillary Clinton would seek greater regulation and even price controls, might benefit as well. More fiscal spending could reinvigorate growth and potentially help to boost the infrastructure sector. While President Trump comes with plenty of uncertainty, it isn’t clear what many of his policy positions are and what he’ll actually push forward as a legislative agenda, nor is it clear what direction the Fed will take under a Trump presidency. He has said he will replace Fed Chairwoman Janet Yellen, although her current term is through January 2018. The Fed is deliberately positioned to be independent of the political process in Washington. That provides an important source of stability and leadership in the short-run. Against a backdrop of stable macroeconomic fundamentals, we at Russell Investments like buying significant dips like this one and prefer non-U.S. assets at this time. We encourage investors to remember that however radical this presidential change may seem, the United States is a big place with a large and diverse economy. And, as Brexit proves, populism is becoming a driving force in global politics today. We don’t think one person—even the president—is positioned to help send the markets permanently off the rails. Savvy investors should look for opportunities as the political environment settles. For us, the big story out of Budget 2016 is of course Morrison’s crackdown on high-end super tax concessions. Ten years on from Costello’s tax-free super savings and now, on the other side of the resources boom, Morrison has redefined the purpose of super as a substitute or supplement to the welfare safety net of the aged pension, not a vehicle for wealth accumulation or bequests. Whilst we welcome the fairness measures and in particular applaud those initiatives that help low-income earners and those with low superannuation balances, we do not look favourably on any announcement that proposes change retrospectively or that may be counterproductive to a person’s ability to save for a secure and dignified retirement. It has now been three weeks since Budget night, but three eventful weeks in the context of understanding the motives and the landscape surrounding the proposals. We have heard from the various sides of the election campaign and now have a sense of what will go through and what might be ‘retrospectively argued away’. As is customary at FinSec, we have opted to wait and deliver a succinct report, focusing only on the information relevant to the financial advice we provide. As always, if you have questions relating to your personal circumstances, we encourage you to contact us so that we can discuss the proposed changes in greater detail. But do not forget, at this stage the proposals are only announcements a lot may change as the legislation navigates both an election and the political process thereafter. Given the relentless media coverage of the issue, it will come as no surprise that markets have been in a state of volatility since the start of the year. This volatility comes off the back of the second half of 2015, seeing a 10% reduction in the value of the Australian market. So all in all, not a market that is causing investors to sleep without a tad of anxiety. Having mentioned the media, let’s not forget that good news doesn’t sell papers, make ratings or lead to web site hits. So, the abundance of bad news has been a boon for the news cycle. So, where to from here? There is no doubt that the world is still grappling with the ongoing issues that caused the financial crisis of 2008. The GFC, as it is commonly known, was fuelled by debt which, in the main, remains. In the regulators’ attempts to avoid financial Armageddon, more debt (cheap debt) was introduced. Recently there has been commentary about $200 trillion of debt, which will never be repaid. Whilst this is a wonderful headline, it fails to mention that with current low interest rates, debt repayment doesn’t make sense. We must, as a result, focus on borrower’s capacity to meet their interest obligations and, in the majority of cases, they are coping. Central banks have printed money to kick start economic activity and lift inflation. Over time, this will dilute the real value of all this debt. But falling commodity prices around the world have acted as a foil for this desired inflation. It has also sharpened the focus on the ability of commodity revenue dependant emerging economies, to service their debt. This is further complicated by the rising US dollar, given much of their debt is US denominated. These are all reasonable arguments to justify some anxiety in markets. But let’s reset. The US economy has turned a corner. Housing has recovered, the unemployment rate is less than 5% (which purists would argue is full employment), the Federal Reserve has had the confidence to raise interest rates (albeit only once at this stage) and company profits are growing. Europe appears finally, to be getting its act together and may well yet “muddle through”. China is in transition and its economic growth is slowing, however, there are still hundreds of millions to the urbanised. It is fair to say China’s internal consumer demand is yet to gain momentum, and their government continues a “whatever it takes” approach to maintaining their status as the wunderkind of the East! Lets’ not forget that China has doubled the size of its economy over the last 10 years meaning growth at today’s rate of 6.5%pa, is still creating more new wealth than when it was growing at 10%pa, 10 years ago. While there are many cultural differences and strategic challenges that will make India’s journey to urbanisation different, it will follow a similar path in that they require the same services and resources available from the Australian economy that China does. This is a good news story for our economy over the longer term. Much has also been written about the collapse in oil prices which has seen the likes of our local darling, Santos, decimated. What hasn’t been widely written about, however, is why the oil price has collapsed. Demand has moderated, yes, but it’s the growth profile that has moderated, not total consumption. We are still consuming more oil than ever and, as the developing world introduces power stations, motor vehicles, transport infrastructure and industrialisation, fossil fuels will be a staple for the revolution. The issue for oil is “supply”, and supply has been driven by geopolitics. While trying to kick-start their economy with little left in their monetary policy armoury, it has suited the US Federal Reserve to have oil prices fall. There is speculation that forces have been at work to drive down the cost of energy to compromise Russia’s funding of the Ukraine conflict. Finally, the OPEC nations have a vested interest in challenging the shale oil producers and other higher cost suppliers. Our view is these political games are near an end and supply will be tapered. This may not result in a return to the prices of three years ago, but it will see a normalisation in the oil price. In turn, this will lead to stabilisation in the valuations for oil producers and their downstream suppliers. It may also deliver the desired modest rise in inflation that will give the US Federal Reserve the confidence to normalise interest rates, and finally reset their economy for the post GFC world. Our view is that 2016 will continue to be a volatile year with regular swings of 100 points or more a day. Much of the volatility will be driven by the markets response to the US Federal Reserve’s approach to interest rates not long term trends. Hedge fund managers constantly reposition their portfolios based on what they know now and bet on what they think will happen next. The weight of money that flows when these decisions are made has the potential to swing markets wildly, albeit in short bursts. Based on what we can see at this point, we don’t see the market spending too much time below 5000 points on the All Ordinaries Index as a foundation is put in place for growth beyond 2016. We have had a relatively good run since 2012, where our market bobbed around 4000 points while we digested the implications of the Greek debt crisis. There has been a dearth of volatility throughout the last three years and, in fact, what we are now seeing is a return to more normal market behaviour. There is no doubt blood pressures will be tested through this period of volatility. However, we remain committed to the tenet that the patient and unemotional investor will be rewarded through appropriate diversification across asset classes and markets, aligned with risk profile, pragmatic manager and stock selection and the implementation of good strategy. I can only hope that by the time this reaches you, things have not changed again! Markets in free fall: How worried should you be? Another terrible day on the ASX is unfolding as tanking Chinese sharemarkets wipe out the past two years of gains (at 3.15pm (AEST) the S&P/ASX200 index was down 4 per cent cent to 5007, the biggest intraday drop since 2007). Is it a correction or something more serious? First the timing of the US Federal Reserve’s rise in interest rates continues to hold investors attention. Investors have now grown used to near zero interest rates for more than 6 years and there is naturally fear that raising them will threaten the still fragile US and global economies. Note: The Fed minutes of the July FOMC showed policy makers judged conditions for higher rates have not been met just yet. Ahead of the hike, markets are following some classic behaviours. According to JP Morgan “Performance of the S&P500 and the U.S. yield curve are broadly in line with the average of the run-up to the last five rate hiking cycles. There are, of course, many warnings that equities will struggle when rates start rising, and in the short run history bears this out”. A softening China is having global implications. The Chinese economy is in the mist of a long-term slowdown as they move towards growth based on consumerism and productivity rather than exports and capital expenditure. The Chinese central bank’s move towards a more market orientated currency value is important in this process. We believe this is the motive behind the Yuan devaluation and not a currency war. Far more worrying is China’s reduced demand for commodities. Given that Chinese demand for raw materials was perceived to drive the great bull market last decade, their lower demand means lower prices, in turn keeping a lid on global inflation. It is, however our view that the Chinese government will intervene with a stimulus plan for the economy (to hit their 7% growth target) and this will stem the heavy selling we are seeing in US oil companies. Third, the growth advantage that emerging markets once offered appears to have diminished. The slowdown in China is not helping and the devaluation of the Yuan has helped accelerate the collapse in emerging market currencies (down 36% from their 2011 high, source AMP Capital). The emerging world now accounts for 50% of world GDP and so their problems are weighing on global growth and investor sentiment as to the longer-term consequence. Fourth, Greek PM Tsipras announced his resignation and the country is now headed for another election (September). While Greece and the Eurozone have agreed on a third bailout program the IMF is likely to insist that Greece’s debt burden is reduced before participating in the bailout with a decision due in October. Collectively this is causing short-term nervousness. It is worth noting just how isolated the recent weakness in the Greek economy is from the broader Eurozone. As a result the most recent Greek crisis is likely to manifest itself as a temporary blip in Eurozone wide confidence, and little more. Fifth, commodity prices are in a secular bear market reflecting an over-supply in almost all raw materials, slowing growth in China (still consumes about half the world’s metals) and a resurgent $US (the currency in which most commodities are priced). Add to this our domestic reporting season and local shares are not being helped by a somewhat disappointing start. So far 46% of companies have beaten expectations and 61% have seen profits rise from a year ago. Sounds ok, but it is down on what was seen in February reports. Given the tendency for good results to come early there is a risk of slippage as the reporting season continues (source AMP capital). On the positive there has been no suggestion of a contraction to dividend payments. From the investors perspective this can be considered more a valuation rather than income correction. In a nutshell, we are learning that the market has a very low tolerance for uncertainty and instability – we are caught in a negative feedback loop (falls in the Chinese sharemarket feed into weakness in Europe and the US and then Asian markets fall again in response to that). Is this the beginning of a new bear market? As Sir John Templeton once observed “bull markets are born on pessimism, grow on scepticism, mature on optimism and die of euphoria”. At the moment we do not see a great deal of euphoria to speak of – shares are not unambiguously overvalued; they are not over loved by investors. It is our view that this is not the beginning of a new bear market, the world economy is not going into recession and interest rates are not going up. Markets are correcting, which is what they regularly do, and in the process coming back into better value. We must also be mindful of the reporting season. Traditionally weak, this has happened in the past: between July and October last year, the markets fell around 10% and within four months were back high again. Longer term investors should brace for a comeback as we are likely to see the bargain hunters move back in as the selling momentum starts to abate. Internationally we think Wall Street will hold up. Stocks had been priced high after a six-year bull market run and there is little evidence to suggest that the US economy is heading for trouble. This pullback is healthy and the market was probably overdue for a breather. Finally we must remember we are investing for income. If you panic and take your money out of the stock market what is the alternative – cash at 2%, property at inflated prices offering little return? Our advice; sit tight, the pendulum can not swing in one direction forever and when it does stop swinging fair value will be the outcome. Steins Law: Greece Succumbed Will we be next? Greece … there has been a lot of noise, a lot of commentary and you have probably (for the most part) heard enough when it comes to Greece – we will keep it brief. Greek PM Tsipras has announced his resignation and the country is now headed for another election (September). While Greece and the Eurozone have agreed on a third bailout program the IMF is likely to insist that Greece’s debt burden is reduced before participating in the bailout with a decision due in October. Collectively this is causing short-term nervousness. How does the crisis affect the global financial system? In our view: negligibly. Since Greece’s debt crisis began in 2010, most international banks and foreign investors minimised their risk by selling down their Greek bonds and other holdings. (Some private investors who plowed back in, betting on a comeback, probably regret that decision now). And in the meantime, the other crisis countries in the Eurozone (Portugal, Ireland and Spain), have taken steps to ensure their economies are much less vulnerable to market contagion than they were a few years ago. Why does the Eurozone keep fighting to keep Greece? Europe has put up safeguards to limit contagion, Greece is only a tiny part of the Eurozone economy and arguably the region would be better off without a country that constantly needs it’s neighbours’ support – the answer therefore, is not so concerned with economic policy, but rather the controversy reduces to power politics. would send a message to voters in Portugal, Spain, Italy and so on, that making enough fuss, and electing extremist parties, results in sweeter deals. It advises other countries that they can borrow as much as they like, walk away from their debts and make the rest of Europe pay the bill: intransigence results in reward. A ‘Grexit’ would also involve a legal minefield that no country has yet ventured to cross. There are no provisions in place for departure, voluntary or forced. Despite the frustration of endless negotiations, European political leaders see a united Europe not as a ‘nice to have’ rather an imperative. How true this is. Greece has succumbed, but it is doubtful that they are the only nation running up against ‘Steins Law’, albeit for different reasons. Using Greece as a base case the following article takes a closer look at those economies whose days of reckoning could be imminent, if their set course does not take on an alternative trajectory.